Few people set out to serve Satan. Mostly, we set out to serve ourselves. Like Frank Sinatra we want toarrive at the end of our lives singing, “I’ve done it my way.” Unfortunately, in making ourselves our top priority, we find ourselves in opposition to God. In his temptation, Jesus chose to serve God, not himself. In refusing Satan’s offer of authority and glory, Jesus uses two powerful words. First, he uses the Greek word “proskuneo,” here translated by the English word “worship.” Proskuneo means to prostrate, or humble one’s self before God, as before a king. Second, Jesus uses the Greek word “latreuo,” here translated by the English word “serve.” Latreuo describes the the kind of service that we render to the one to whom we have given our allegiance. In point of fact, either Greek word can be translated by the English word “worship,” for each describes a stage of worship. Our worship always begins with submission, but true worship always issues in service. Jesus settled the issue of his personal submission to God during his temptation in the wilderness, and he never looked back. All of his life and work was lived in submission to the will of his Father. When Jesus knelt in the garden he prayed,“Not my will but your will be done.” Jesus lived his commitment to the bitter end, forcing a conflict with the authorities who arrested him, gave him a mockery of a trial, and crucified him between two outlaws. Few of us settle the issue of submission like Jesus, “Once and for all.” Many of us go through life “limping along between two opinions.” Somedays we serve God. Somedays we serve ourselves. The people who really change the world are those who, like Jesus, settle the issue once and for all, and then, never look back. Have this mind among yourselves which is yours in Christ Jesus, who though he was in the form of God did not count equality with God a thing to be grasped, but emptied himself taking the form of a servant, and being found in human form he humbled himself, and became obedient unto death, even death on a cross. Therefore God has highly exalted him, and given him a name which is above every name, that at the name of Jesus every knee should bow, in heaven, and on the earth, and under the earth, and every tongue confess that “Jesus Christ is Lord,” to the glory of God the father. Jesus humbled himself before God. He settled the issue of submission, and then he served God in all that he did. He looked into the face of his Father, and then he looked into the faces of the world, and he spent his life, and his death, bringing us back together. Jesus has a lot to teach us about service. Now you know that Mammon means not just money, but money and the whole money system. 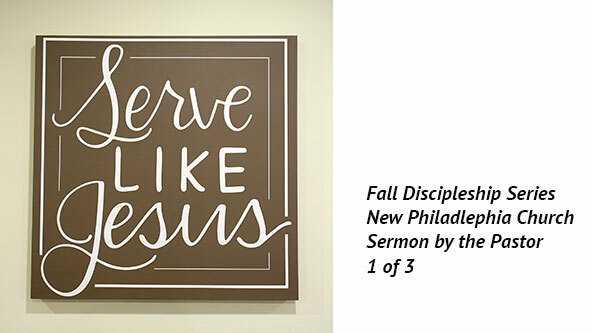 You also know that this is not supposed to be a stewardship sermon, but a sermon about “Serving like Jesus.” However, we cannot talk about serving like Jesus without listening to what Jesus has to say about service. And one of the few times Jesus talks about serving, he points out that we cannot serve God and money. When Jesus says that we cannot serve God and money, he does not mean that we cannot use money, he means that we must not allow money to use us. That is, we cannot make all our decisions based on money. We put money in its proper place when choose between two jobs, and take the job that offers less pay, but more opportunity for doing the things we want to do for the people we love. We put money in its proper place when we make some promise involving money, and then keep that promise, even when it cost us more than we thought it might. Psalm 15 says a person is righteous when “ he swears to his own hurt and does not change.” We put money in its proper place when we pass up some luxury that we have promised ourselves, so that someone else might enjoy a necessity. When Jesus says that we cannot serve God and money, I do not think he means that we cannot use money. Nor do I think that Jesus implies that every contest for our affections would be between God and money. In Romans 16 St. Paul says that some of us serve our own appetites. Our appetites are many. In 1st Thessalonians 1 the apostle says that believers in Thessaloniki turned from idols to serve the living God. Ordinary, Paul defines an idol as a false God, made of wood, or stone, or some precious metal. Yet, he knows, and we know that there are idols of many kinds. In fact, there are so many idols, that my idol and your idol may not even resemble one another. The thing that is wrong for me may be right for you, and vice versa. Here is the kicker: Money is one of many idols, but money is often what we might call “the gateway idol.” If we have plenty of money, and if we allow it to control us, rather than putting it into its proper place, we often end up serving the idol or idols of our own choosing. Jesus returned to this theme several times. He told his disciples that it is only those who humble themselves, who will be exalted. Likewise, in John 13, Jesus took a towel and washed their feet, saying, “14 You call me your Master and teacher, and so I am , if I then, your Master and Teacher have washed your feet, you also ought to wash one another’s feet.” I have never participated in a foot washing, but one day, I was helping my father, in a way that he could not help himself. I was embarrassed. Then I realized it must be worse for him. I said, “I have never been to a foot washing, but I suppose this is like a foot washing.” He said, “I suppose it is.” The tension was broken, and somehow, God was there. The Twelve did not learn this lesson of serving one another as easily as we might have hoped. In Acts chapter 6, after the death and resurrection of Jesus, the apostles are working hard at doing lots of things in the church at Jerusalem. They often find themselves waiting tables, because the Jews and Greeks are jealous of one another, and they want the disciples to exercise portion control. The Twelve think they are not making good use of their time, so they approach the congregation at Jerusalem saying, “It is not right that we should give up preaching the word of God to serve tables.” It was after this appeal that the church elected seven men to be deacons, including Stephen the first martyr of the church, and Philip the great Evangelists. I think it is interesting that two of the seven deacons achieved more prominence in the history of the church than all but three of the original twelve disciples, Peter, James and John. It may be that the disciples should have kept serving tables, while they preached the gospel. We might have a better memory of them. I suspect that is true for many of you. You want to do more, and you want to know how to do it. You want to serve like Jesus because you already know that it is in the service of others, that we find fulfillment for ourselves. Not only so, but in serving others we often discover that our own faith grows by leaps and bounds. When John Wesley questioned his own faith, he approached, a Moravian brother, Peter Boehler, and asked him if he should leave off preaching. Boehler said, “No, John Wesley, preach faith until you have it; and then, because you have it, you will preach faith.” I will say the same thing about service, if you lack faith, then serve until you have faith, and then because you have faith, you will serve. In Matthew 25 Jesus promised his disciples and us through them that in serving others, we are serving him, and sometimes, as we serve others, he allows us a moment of recognition so clear, that we are never the same again.